“So, what’s next?” Now there’s a question. I guess if that’s something I get asked frequently then I’m doing something right?! My usual answer is: I’m Saying Yes More! Just like many people I felt the need for… more. At the time the idea was born I was 32 and well into my career as a firefighter with a lovely house by the sea in North Devon where I can surf and generally just enjoy the area with my wife, Louise. So it is certainly a good life but, and this is very cliché - I truly believe this is my one shot at ‘being Scott’ and dammit - I want it to be great! More than that I don’t want it to end and for there to be nothing left behind to say ‘Scott was here’. That was it – the plan was born: ‘The Journey To Mount Elbrus’. But boy were there some challenging times! The boat I bought, Pacific Pete, turned out to be rotten, the trailer fell apart...and those things were just the tip of the iceberg. After repairing Pete with no boat building knowledge at all, I set out to pedal the 1,800 miles across Europe in June 2016. The bike sat nav didn’t work, I hadn’t trained enough and my car that my friends were using to tow Pete to Bulgaria blew it’s turbo in France... and there it stayed for six months. Bugger. This changed things. I’d finish the cycle and have to continue the journey the following year. What an amazing if challenging 18 days in the saddle though! I was shown the warmest hospitality and kindness, both large and small. When you’ve battled up an enormously long and arduous hill in belting heat – getting your first of many ‘split Lips’ (the result of a lack of lip balm!) and the little old woman who speaks no English shows you to a chair in the shade and brings out fresh lemonade, you are reminded of the generosity of people, and a faith in humanity, which can easily be lost in the daily bombardment of the negative news cycle. A year later, I was finally in the port of Burgas with my boat, and making amazing friends. I gripped the oars and set off in my old plywood ocean rowing boat - I was buzzing! For five days I rowed, grappling with the two hours on, two hours off system used by most ocean rowers. Then came the winds and I sat for eight days on my Para anchor (sort of kite that is deployed into the water that slows you down when you’re going the wrong way!) being slowly blown backwards towards the Turkish coast, spread eagled in my little cabin trying to stay ‘comfy’. Just as I was running out of sea to retreat into, the winds changed and off I set again, dispensing with the two and two system. I rowed all day, bar food breaks and slept for four to five hours a night. The romantic side of it all was eating my meals in the company of dolphins and enjoying breathtakingly beautiful star-filled night skies, a Cuban cigar billowing into the night. After twenty nine days I made it to Georgia with another split lip, lighter and hairier than when I had left. I was greeted by a film crew who spoke no English and they paraded me around for a while! 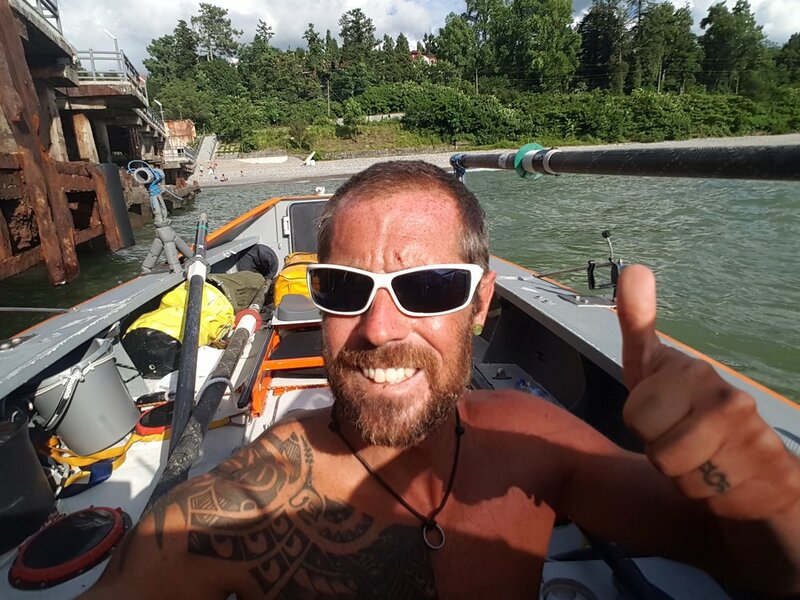 It was never an aim for the adventure but I had become the first person to ever row across the Black Sea. Pride doesn’t even come close to the feeling. I had a few days of rest being entertained and fed by the locals in Batumi who had taken me under their wing and toasted me at every opportunity. 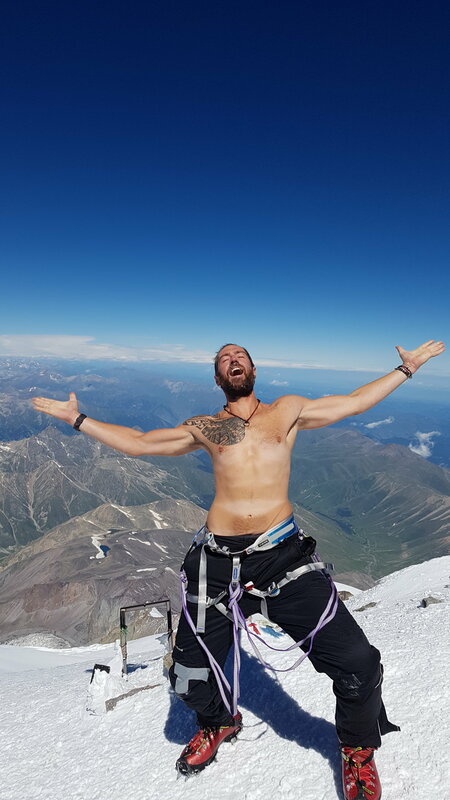 Then I was off to Russia and the 5,642 metre summit of Mt Elbrus, taking 10 days. Summit day was wonderfully clear and for that moment, I looked down upon everyone in Europe. The release and sense of achievement was indescribable. So many things had gone wrong – more than I’ve mentioned here - but sheer determination got me through. This was my turning point. This was Scott coming to the party. The Marathon des Sable, the Three Loch Challenge (tandem bike, trailer and two inflatable kayaks), the National Three Peaks challenge, the South Downs way and a second world record followed. I ran the fastest half marathon ‘under air’ - I was wearing the breathing apparatus (BA) that we wear for firefighting. It weighs in at 16kg and I had to change the cylinder every 2 miles! I did the race in 2hrs 21 mins. Yes I enjoy challenging myself and will always do solo adventures but now I want more people to say YES! The kick I get out of floating an idea to someone and then see them get enthused and say YES! is fantastic. So we returned to “What’s next then?” and it wasn’t long until our next challenge! In our four days off from work, five of us shot up to Windermere in the Lake District to complete a loop of the Lake District on foot and camping. We completed a memorable 70 miles which included knee deep snow ascents of The Old Man of Coniston and the Black Sail pass – which we were lucky enough to enjoy to ourselves in stunning weather. Everyone dug deep and although we didn’t make the ambitious 93 miles, each one of us discovered something about ourselves in tough conditions to reach the end. As for this year’s plans – in June, my brother and I are going from Turin to Venice, which is 422 miles - on Razor kick scooters... wearing capes. Add building a railway pushcart and trying to convince someone to help convert a Tuk Tuk to salt water power to drive the coastal road around Ireland with my wife Louise and our dog Hank; currently selling handmade (by my mum!) bobble hats; purchasing a Pedalo to travel the length of the Rhine; and maybe, just maybe, rowing the Atlantic. With a gazillion ideas and plans in-between, the future is busy. So it should be. I’m neither fearless nor very, very fit – the truth is I’m a ‘regular’ guy who wants to see and do everything! I relish the solo challenges of pushing myself both physically and mentally. When out on your own you have to find your own motivation when it gets tough but you also have that vulnerability about you that makes you approachable, so you are likely to meet wonderful and diverse people this way. On the flip side I REALLY enjoy motivating and involving other people who perhaps wouldn’t embark on a challenge themselves, for whatever reason. The team dynamic, much like a crew at work, brings strengths from individuals to make something much more powerful – we become stronger together. I’m a ‘jack of all’ – not brilliant at anything, but why should that stop me from trying? Trying to learn. Trying to grow. Trying to find my limits. Life is a wonderful journey – sure, it can be a rollercoaster with its ups and downs, its pains and joys, but it’s up to us to try and make those highs outnumber the lows. Is there a secret recipe for all this? If there is I haven’t found it! We are all different with different motivations, goals and methods but one thing should be the same. Make the most of this precious life and do what makes you happy! Adventure doesn’t have to be big and expensive. Adventure is what YOU want it to be and just like wearing odd socks, it’s liberating. You just have to say YES!